Before I tell you about how I create these, let me back up and tell you about why I started doing them in the first place. In order to find a publisher, an author usually needs a good “platform”—which, simply defined, is the audience the author has influence with, usually consisting of social media followers, blog readers, and so forth. One of the tried-and-true ways to increase blog followers is to offer free downloads as an incentive for subscribing. Many other Christian authors offer free downloads of inspirational quotes or scriptures. As a designer, it would be simple for me to do the same thing, but then I realized that as nice as those are (and I hope to offend no one when I say this), those weren’t really something I wanted or downloaded for myself. So I started researching, looking for something I could offer that related to my book (Praying Upside Down) and seemed specific to me. My Pinterest board from that time was filled with downloadable quotes, prayer journal pages, etc… but nothing really jumped out at me. I didn’t want to do something just for the sake of having something, but I wanted to create something useful. 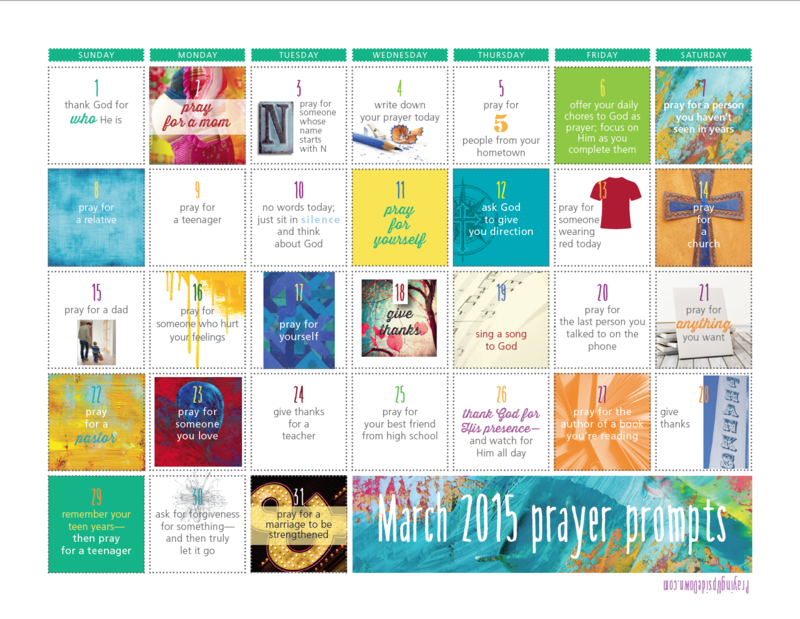 Then I saw a calendar somewhere, and I thought, hey, what if I made a monthly prayer calendar? When I sat down to do it, I grabbed a bunch of random, colorful photos and started playing around. The first several months were completely haphazard. Over time, the process evolved, becoming less random and more intentional. I started thinking about themes (beginning with giving thanks for November), and then, apparently, I got tired of bring confined to the straight calendar grid and started breaking out of that structure. People started responding to the calendars, and I started keeping a list of potential themes or graphic ideas when I saw something that inspired me. 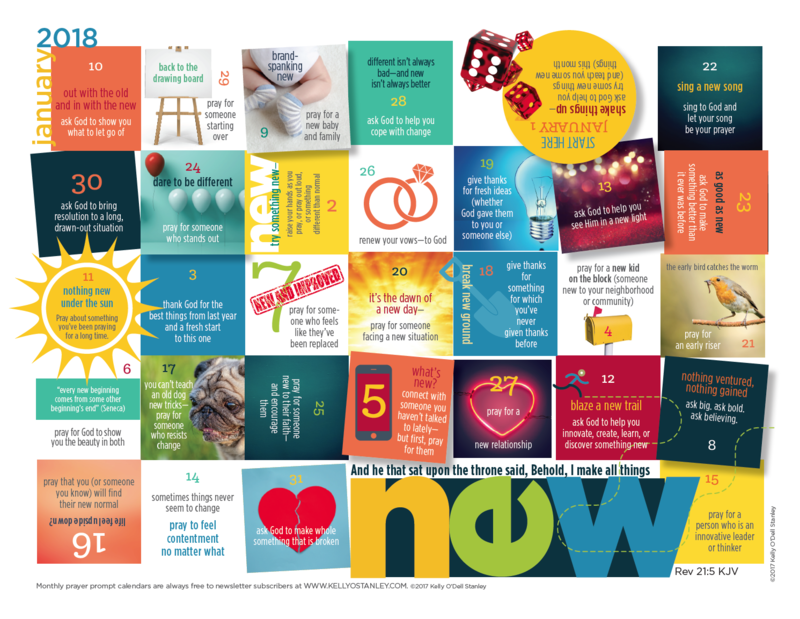 I’ve done a few calendars tailored to the content of some books I loved (Hope Prevails by Dr. Michelle Bengtson, Rush by Jayme Mansfield, and The Spirit-Led Heart by Suzie Eller), and some just based on fun or graphic images I found. 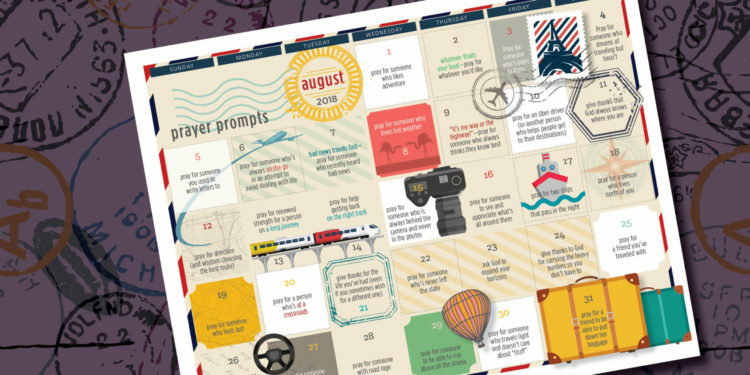 Somewhere along the way, these calendars became one of my favorite things to do. They’re all about prayer… creativity… coming up with something new… having fun… finding a new look, a new approach—a combination of words and images and prayer that I’m uniquely suited to create. I’ve been making these monthly since March 2015—over three years—and I’m not tired of it yet. As you can see, especially when you compare these to the first calendars I did, they’ve definitely evolved over time! let’s talk about the specific process of making one. I start with just a vague idea about possible themes, usually tied in somehow to the month. If it’s spring, it might be focused on growth, or words and phrases connected to the color green. Summer might be about freedom. 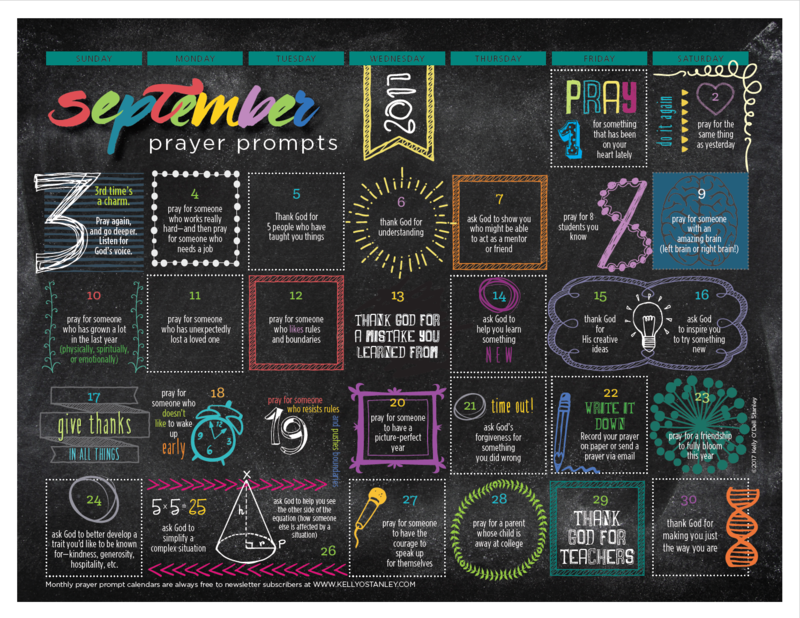 September might be back-to-school (even though our schools start in August—old habits die hard)—perhaps a chalkboard theme, or teaching or learning. Some of the holiday months are pretty obvious—gifts for Christmas, gratitude for Thanksgiving. 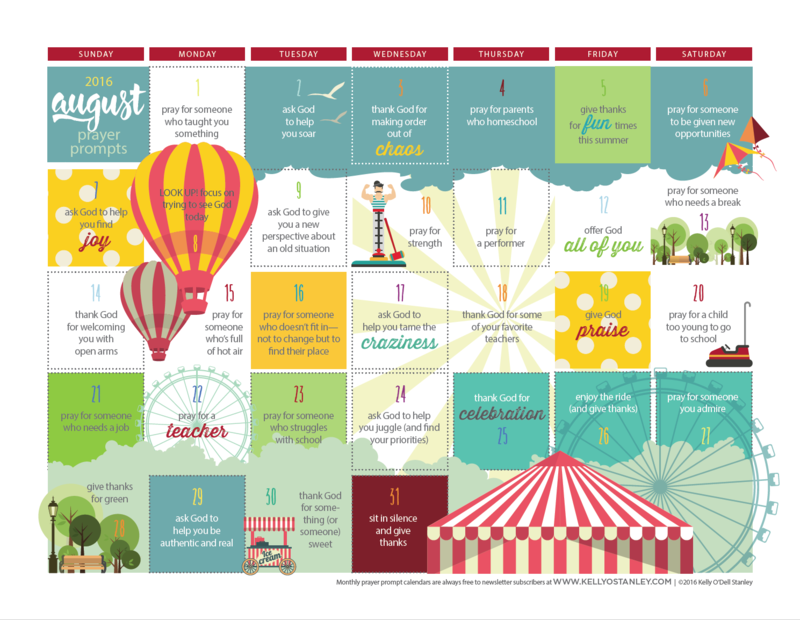 For my August calendar this year, I considered some concepts related to the month—the colors of the August birthstone, definition of “august,” checked out the holidays that month. In the end, I chose the theme of travel/exploration/adventure, simply because I was preparing for a trip to Malta and that was the mood I was in. 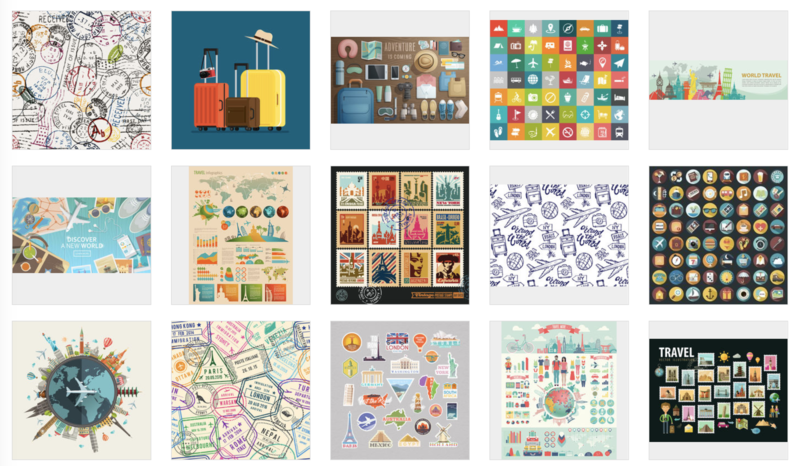 From there, I went to Shutterstock.com, a stock photography and illustration site I subscribe to for my graphic design business. I scribble ideas on a piece of paper and start searching related words, looking for some kind of overall graphic look. It might be a complicated illustration, or a border and a bunch of little pieces. I collect them in a “lightbox” until I have plenty of possibilities. Using Adobe Illustrator, I can change colors, modify shapes, and so on. 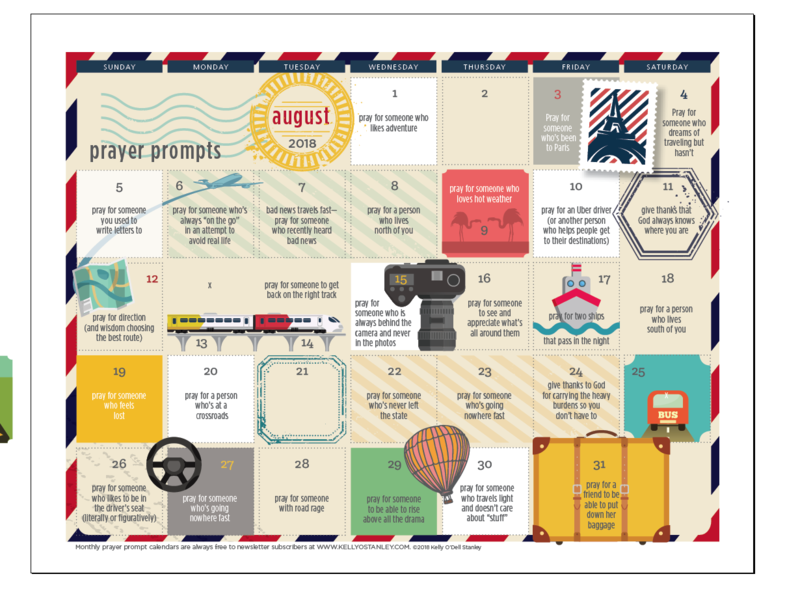 I decided that I loved the look of the retro travel stuff, the postmarks and luggage tags, so I started playing with the airmail envelope border and then filled in with smaller graphics related to the individual prayer prompts. I also picked one graphic to use as my primary color palette (the six postcards in the third graphic in the row above this paragraph). 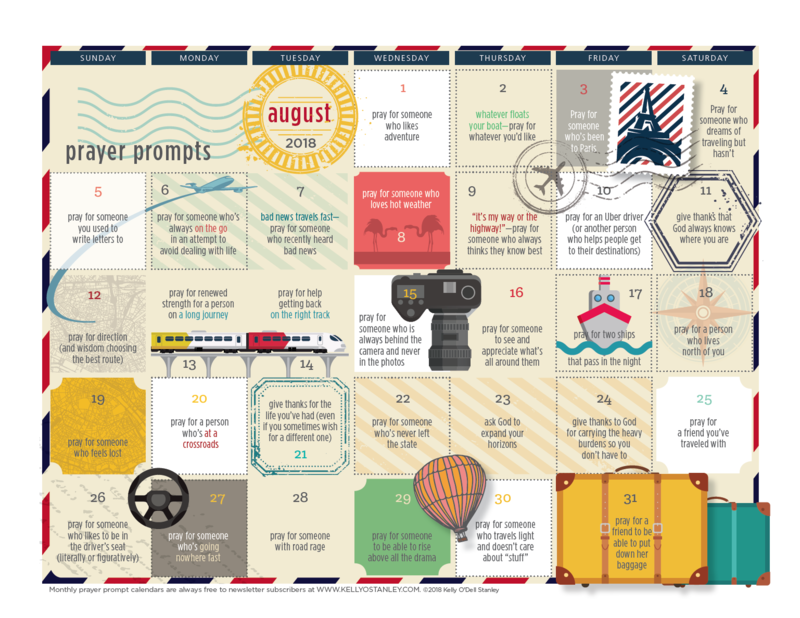 Starting with my calendar template in Adobe InDesign, I began copying and pasting individual elements to try to come up with a workable structure. 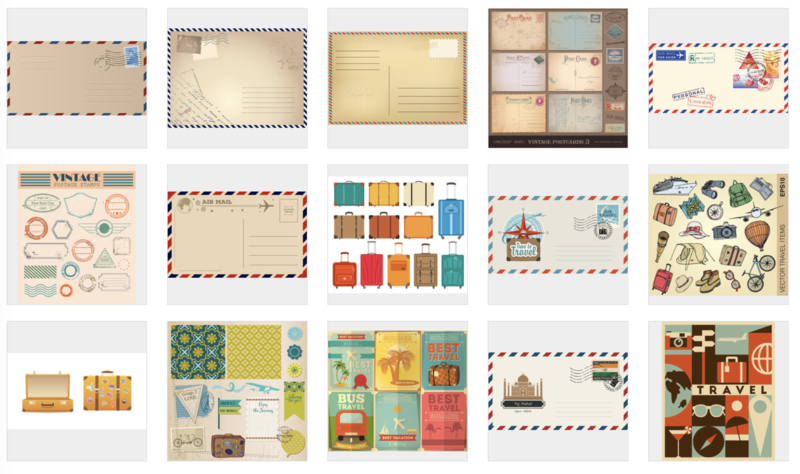 Then I looked for more graphics on Shutterstock related to some of the key words that seemed to have potential. Next, I pulled out some of those pictures and scattered them around the page, then started typing in (in a random order) some of the prayers inspired by the images. I keep paper in front of me so I can jot down ideas as they come. From there, it’s simply a lot of back and forth… a few prayers, a few more images, a few more prayers inspired by those images. It’s like a giant crossword puzzle, and I keep moving things around until they fit. 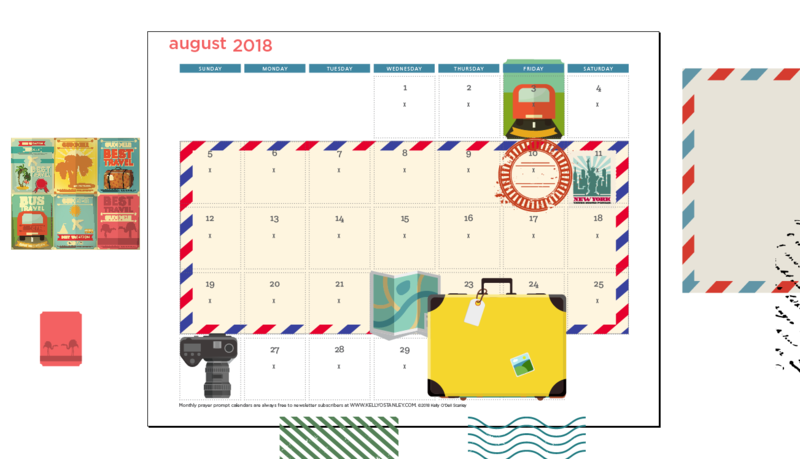 I add some color here and there, add things in, take a few things away, substitute shapes and color blocks for some of the calendar squares… Eventually, all the squares are filled, and I’ve squeezed in whatever graphics I can and found a reasonable overall balance to the page…. And voilá! The calendar is ready to download. It’s always just a trial and error process, one in which I follow my gut instinct and operate on a whim. I try to find funny twists on the words and graphics, and I don’t shy away from irreverence. I want this to be fun, and real. 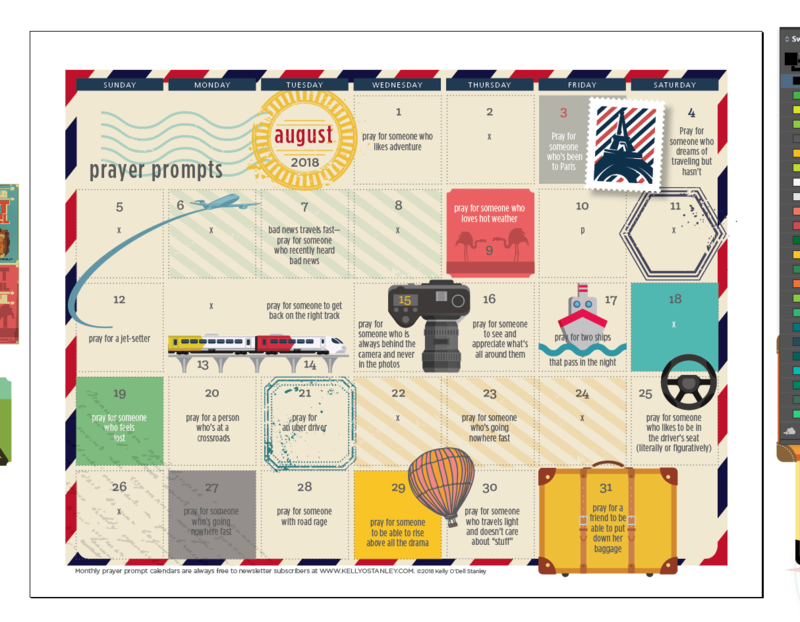 I want people to know that prayer doesn’t have to be stiff and formal, that it can be fun and whimsical. And from there, I hope people will take the same approach I used to create these—and run with it. 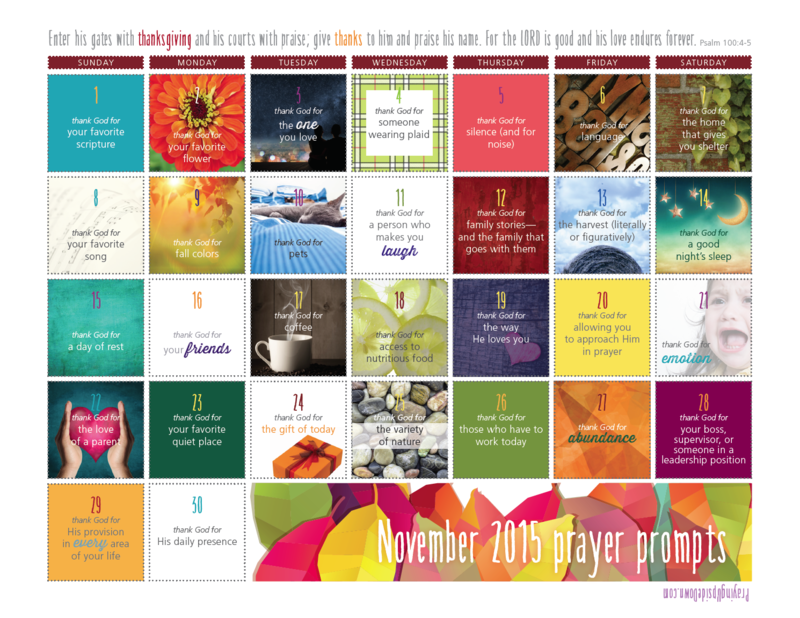 Use the prompt to get you started but let your mind roam freely from there. Follow the seemingly random connections. Let God bring people to mind and use your individual thought processes in a creative way to guide your prayers. I can provide a starting point, but it’s up to you—and God—where you go with it from there. Just as I go back and forth, following whatever obscure connections I see in the space between the words and the pictures, I hope you will follow those trails through your own brain. We’ll never get it all. We’ll never pray about every situation that needs prayer. We’ll never remember everyone we care about. The world’s needs are too great. People are too numerous. We’re too limited. But our God is a creative God. I believe He delights in us when we offer our creative selves to Him, when we try to channel that creative energy that is at the foundation of who He is and all that He creates. 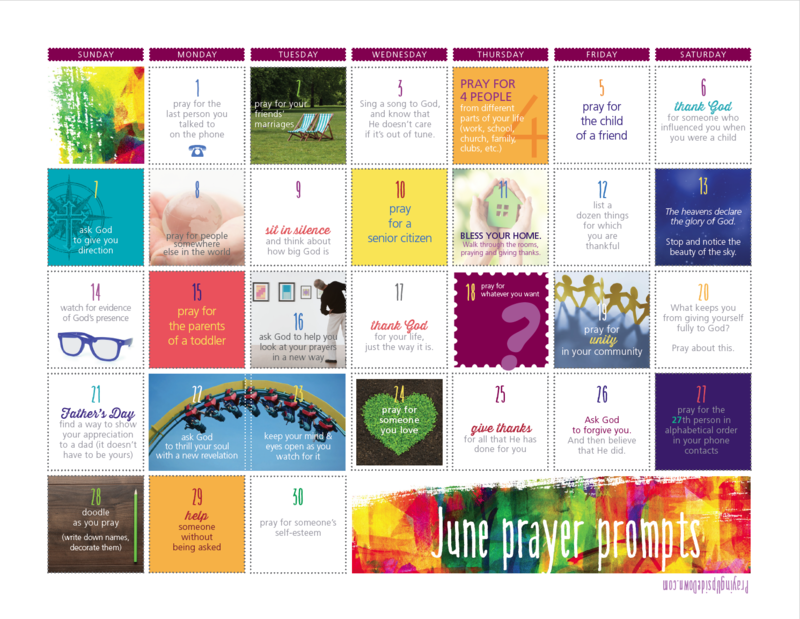 I believe He uses these calendars—not because of anything I did, in particular, but because each one of you opens yourself up to His leading when you open your mind to prayer. I’m thrilled that I get to be a part of it. Hi Kelly! 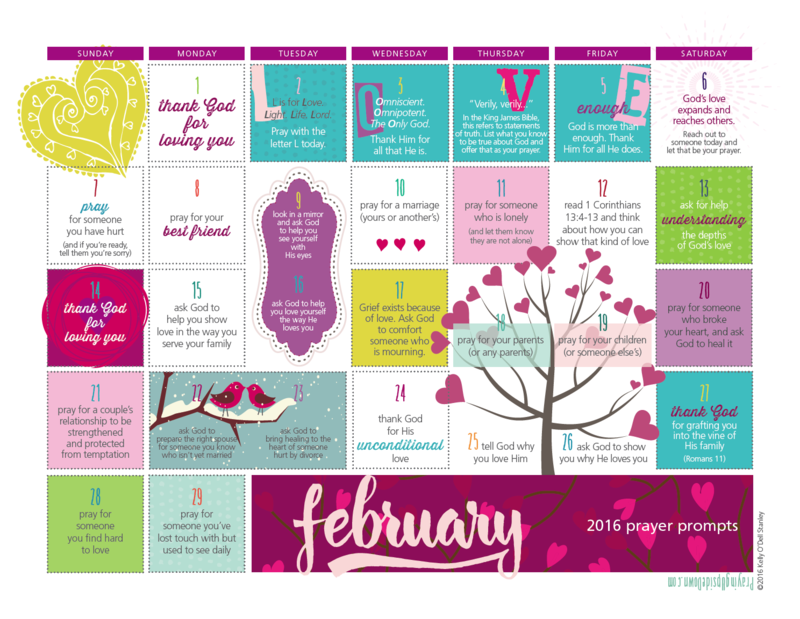 I love your monthly calendars and use them in my planner. It is so cool to see your process. These are so wonderful, it is clear that a lot of work goes into each one, so seeing the work makes it even more impressive. Thank you so much for making and sharing these every month! Thanks, Robin! I love doing them, though, so I really don’t mind!